In this activity you will explore potential relationships between extreme climate events (droughts) and human population movement (as indicated by watershed rooms abandoned). The method you will employ as a starting point in this analysis is temporal correlation. (Remember, as we discussed in class, temporal correlation does not demonstrate causation). This basic exploratory approach can be used to identify statistical relationships between many kinds of independent and dependent variables. We will discuss this activity in class before it is due. Your results may be used in the Climate and Human Behavior project (if you select this project). BUT, WAIT - if you haven't downloaded the desktop version of Microsoft Excel, please do this now. It's free to you as a student and much more robust and easy to use than the online version or Google Sheets. Seriously, please do this. 1. Using the data on drought and the percentage of watershed rooms abandoned in the Table below, please develop six scatterplots that demonstrate the relationship. Label the x axis (your independent variable), the y axis (your dependent variable), and your data points (e.g., 1200-1249). As an example, the scatterplot for Watershed 1 is below. You may produce these scatterplots with any computer program, but not by hand (learning how to produce the scatterplots is part of the benefit of the activity). The line that goes through the data points is called a regression line. We will briefly discuss how to produce these scatterplots in class but I encourage you to use one of the many online resources available to help you produce these plots (e.g., see this YouTube video). 2. What are the Pearson product-moment correlation coefficients (or Pearson's r) for each relationship? The correlation coefficients are a measure of what? Note that r and r squared are different statistics; I am asking for r.
"In the Agua Fria watershed, there is a weak linear relationship between drought and room abandonment, indicated by the correlation coefficient r = .31 and the poor fit (or distance) of the data points to the regression line. The low coefficient and poor fit indicates that much of the variance in room abandonment among people living in the Agua Fria watershed is not explained by changes in the percent of years identified as a drought. Other factors besides changes in these drought years influenced changes in room abandonment." I strongly recommend that you use the above specific sentence construction in your answers. Also, remember that a relatively high r value does not necessarily demonstrate a relationship between the variables---you must also visually inspect the distribution of the points. Insert each scatterplot adjacent to the text interpretation. Scatterplots should be as tall as they are wide - this allows appropriate visual inspection. 4. What is your interpretation of the potential relationship between drought severity and room abandonment in the region comprised of the watersheds below? Please insert your scatterplots into a Word document or pdf with your interpretations and upload to Canvas. 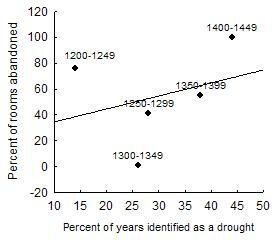 This is the scatterplot demonstrating the relationship between the percent of years identified as a drought and the percent of rooms abandoned in Watershed 1. Your other five scatterplots should be similarly developed (using Microsoft Excel or another on-line program).